We understand companies who provide equipment and machinery need to deliver a quality product. And you need know your customers’ equipment better than they do. You need to excel at customer service both in the office and in the field. The easiest way to achieve this is through a system which automates information for both your staff and your clients. If you provide after sales services we have a solution to keep your field engineers connected while on the road. We've worked closely with our customers to help them use SAP Business One while away from the office. We understand that if you resell or manufacture equipment and machinery, you have to follow strict rules and regulations. Therefore, the Ochiba OPTIONS range makes sure you can easily comply with the legal needs of your industry. SAP Business One from Ochiba manages your entire product lifecycle. From sales estimating a job, through production, accounts, stores, and after sales services. This means you'll have complete clarity of the whole process within a single system. Field service may cover a wide range of industries and applications. 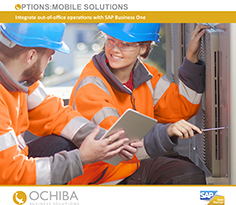 However, SAP Business One and the Ochiba OPTIONS range will benefit you whatever your sector. We've worked closely with our customers to create the Ochiba OPTIONS range. Which has been developed to solve the issues SAP Business One couldn't easily answer. The range offers products to help companies who provide after sales services. We understand you need to manage orders through workflow controls. As well as the importance of tracing goods and parts from production to delivery. This is why our solution creates customer equipment cards. It means all serial items used in the build are identified and tracked. Our customer in the service sector find this particularly useful. Our mobile solution means you can issue work to engineers while they're on customer sites. It then records their progress, plus the time and materials taken to complete the job. And, you can keep track of from the office. The engineer can even complete Safety Records, Equipment Service Records, Inspection Certificates and Field Surveys. We can also offer the Ochiba OPTIONS Configure-to-Order module. It makes use of predefined rules to quote for new jobs. This means orders can be processed quicker without extensive product knowledge. Plus, the whole process is sped up even further as any Bill of Materials (BOM) are created automatically when the order is confirmed. Motivity is a simple, easy to use, software for field maintenance and service companies. It allows your field force to receive jobs and return completed job sheets electronically – all via a mobile device. Motivity makes all your paper-based forms and certificates accessible electronically on any web-enabled device. This means everything everyone needs is available on tablets, PDAs, mobile phones and PC's. You can enter data about jobs at the customer site and send the information back to the office in real time. It enables you to capture, store and share information about a job instantly. This means customers can sign off work there and then – using a digital signature. And then you can share the information with the customer straight away. Motivity manages your contracts so you know you’re compliant, have the resources to fulfil the contract, and that you’ll meet your SLAs. It monitors contracts to ensure they stay profitable. Plus, you'll win more contracts because you can estimate costs better. Whether you want to keep track of jobs or need to prove ISO compliance, it's a reliable way to store and retrieve information. Motivity will capture details including forms, certificates, signatures and photographic evidence. Motivity is a very easy to use, yet powerful, business tool that impacts your entire business, not just our field operations. Coresuite Mobile is a cloud based solution which connects your employees with SAP Business One when out of the office. Whether sales or servicing it will make information available, update records and take notes. And then upload it straight into SAP Business One. You can work anywhere, either online of offline and know data will be sent once reconnected. Coresuite Mobile Sales & Service means your employees have all the information they need all the time. Whether service orders, client details or installed equipment it's at their fingertips – on and offline. Every activity or task can be recorded with dynamic checklists. Capturing time and materials on the go becomes easy. Streamlined checkout process and automated service reports make service jobs simple and efficient. Field engineers can send all the job information straight to SAP Business One with the push of a button. Moreover, the integrated sales features turn your engineers into a sales force to generate new business. You'll be able to record all the serial items used to build a product on the Customer Equipment Card. Therefore you can allocate and track serial numbers for every single product. Call 0114 299 9430 to discover how we can uniquely solve the issues faced by the service industry.